This definition of “urban sustainability” overlooks key facets of a city’s ecological footprint (such as food systems, resource consumption, production related greenhouse gas emissions, air quality, and the urban heat island effect). It also ignores the ability of non-state actors to contribute meaningfully to the design and implementation of urban policies and programs. But that doesn’t need not be the case. In fact, if employed properly, new information technologies seem like ideal tools to address some of urban sustainability’s most persistent challenges. Read the rest @UGEC Viewpoints. the tensions between path-dependency and innovation in urban sustainability planning and action. – The working language at the INRS is French, and knowledge of English (and other languages) is considered an asset. Students may submit written work in other languages, but they must be comfortable enough to participate in courses which are given exclusively in French. Support is available to students wishing to improve their French language skills. la recherche scientifique is the highest-ranked academic research institute in Canada in terms of research intensity (funding per faculty member). One hundred and fifty professors and more than 700 graduate students and postdoctoral research associates work at its research centers in Montréal, Québec, Laval, and Varennes. INRS research teams are active in both fundamental and applied research and play a key role in developing practical solutions to problems confronting society. the impacts of “smart” approaches to green cities on governance, democracy, and public participation. The Institut national de la recherche scientifique is the highest-ranked academic research institute in Canada in terms of research intensity (funding per faculty member). One hundred and fifty professors and more than 700 graduate students and postdoctoral research associates work at its research centres in Montréal, Québec, Laval, and Varennes. INRS research teams are active in both fundamental and applied research and play a key role in developing practical solutions to problems confronting society. MONTREAL — Everyone loves talking about the weather — but it seems no one likes talking about climate change. It’s too bleak. Unless we are talking about cities. Unlike most countries, cities actually seem to be doing something. From Copenhagen to Vancouver, we are surrounded by great examples of what smart green cities look like. That gives us hope. It also gives us a much-needed break from the depressing geo-political mire that bubbles to the surface with every new round of climate-change negotiations. So far, though, successful responses to climate change have been confined to a relatively small group of celebrity cities. There are more than 1,000 large and mid-size cities in the world. Only a small fraction of them are taking effective action. But we may have reached a turning point. And Canadian cities are leading the way. Until recently, I was based at the Massachusetts Institute of Technology. My focus there was running the first international survey of the way cities are responding to climate change. The project collected data from 350 cities around the world. The goal wasn’t to list their top green projects, or record how many tons of CO2 they had reduced. That information is already out there. We wanted to go beyond that and look at how they were doing what they were doing, and who was involved in taking good ideas and getting them implemented. Here’s the real challenge: climate change isn’t an isolated issue. It is as much about the environment as it is about transportation, economic development or health, for example. That means that if you want effective responses to climate change, they have to be cross-cutting ones. They have to be responses that weave climate-smart principles throughout the fabric of our cities. But that’s not how cities do things. Climate-change responses tend to be much more isolated, like the new kid at school playing off at the margins of how cities get their “real work” done. Or at least they were. Something significant has changed. Cities around the world (75 per cent of the cities surveyed) report that they are now mainstreaming climate change as an issue into the plans that govern the overall direction of their development. Climate change, in other words, is becoming part of the DNA of how we approach urban planning. This is particularly the case for Canadian cities. When you look at cities in Canada, you see that they have evolved dramatically from laggards to leaders when it comes to integrating climate-change planning across different municipal agencies. Vancouver is a great example. The city’s Greenest City Action Plan links together climate-smart goals for everything from spatial planning, transportation, job creation, green buildings, food security and health. This is a major shift from the more siloized planning that was happening even just a few years ago. And it is good news. Only coordinated city-wide strategies are going to help. Look south of the border and the contrast is striking. American cities remain stuck in a siloized approach to climate planning that was the hallmark of the early days of the green-cities movement. Canadian cities now rank at the same level or above their peers in Europe. Besides disappointing results from the United States, the survey also revealed other challenges. Cities continue to have trouble reducing emissions when it comes to areas like residential and commercial energy use, or emissions related to transportation, or local industry. In most cities, these areas account for the bulk of urban emissions. In Montreal, more than 90 per cent of our emissions come from these four areas. If we aren’t making progress in those areas, then we aren’t making progress. Period. Unlike changing the light bulbs in city hall, reducing emissions across the city as a whole requires strong partnerships with local businesses and communities. Some cities have nurtured these partnerships, and they are paying dividends. Currently, community groups and civil-society organizations are contributing the most to their cities’ climate-change efforts. They are actively engaged in helping to transition their cities to greener forms of urbanization. Local industries and businesses, by comparison, are missing in action. Only a very small minority of cities report that the private sector is actively engaged in helping to design or implement their climate-change strategies. Internally, economic-development units within municipal bureaucracies are also among the least engaged. This is a hurdle in Canada as much as elsewhere. But we also have strong leaders. Energy policies in the city of Guelph, for example, both reduce greenhouse gas emissions and create jobs (to the tune of 400 new jobs in the renewable energy sector). In the U.S., standout cities like Portland, Ore., have had similar successes in home energy retrofits and residential solar energy. Here at home, electric vehicles are a major opportunity for Montreal to slash our emissions and support job creation. Whether we are going to make the most of it remains to be seen. It’s not that the private sector holds the key to dealing with climate change. But as drivers of innovation, pools of capital, and areas for emissions reduction, they are clearly important partners. Unfortunately, in most cities, they aren’t coming to the table when it is time to design and implement our climate plans. The shift to a more effective urban engagement with climate change has started. The continued integration of climate change into our business-as-usual approach to urban planning will open the door to more far-reaching responses than we have seen so far. Building strong partnerships with civil-society groups and local businesses will also be key to their success. Right now, only a small cohort of leading cities are taking these partnerships seriously. But that may change as more and more cities realize the cost of inaction, and the benefits of working collaboratively to build smarter, greener and more livable cities. Alexander Aylett was the Banting Postdoctoral Fellow in Urban Climate Governance at the Massachusetts Institute of Technology. He is now a professor at Université INRS (Institut national de la recherche scientifique) in Montreal. Almost 100 participants, 12 projects, 4 specially proposed challenges, 6 newly released data sets and lots of happy faces at the end of the day. 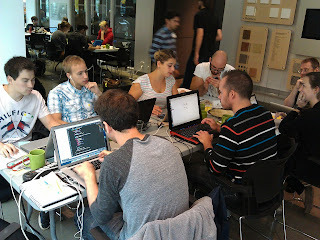 A huge thank-you to everyone who came out for the inaugural ecoHack in Montréal last weekend! écoHackMTL set out to bring together programmers, community activists, and urban environmentalists to design digital tools that allow for deeper citizen engagement with urban spaces and urban sustainability. Last Saturday’s day long hackathon was a first attempt at bringing urban sustainability into the digital age. It was also the culmination of 6 months spent hosting little events around the city to build bridges between developers, environmentalists, planners, and anyone else who was interested in building a greener city. It was fun, but time consuming work. Developers learned about urban sustainability. Environmental advocates and activists learned about programming and data. And everyone went away with enough of a shared language to collaborate on some amazing projects. Check out ecohackmtl.sparkboard.com to see the prototypes that came out of the day. While you are there you can also vote for your favourites. If you are in Montreal, stay tuned for the details of our November 14 wrap-party where we will announce the winners of the “Participants Choice” and “Public Choice” awards. I’d also like to send out a heartfelt thank-you to all to the volunteers and advisory committee members who made the event possible. The City of Montreal was supportive from very early on and released a dozen new datasets for the day of the event. And Siemens Canada our principal sponsor. 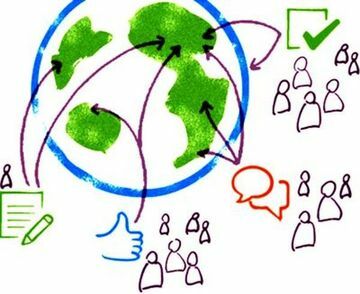 openalex: Crowdsource Climate Solutions: Last Week to Vote on MIT Climate CoLab! The shortlists of submissions were selected by expert judges earlier this summer. Since then just over 2500 people have voted for their favourites so far. VOTING ENDS THIS WEEKEND! Anyone can vote. Just click here to get started. You can also test your luck, and see if you can predict which project will win the Judges’ Choice award and/or the Grand Prize. I don’t have answers to those questions. But I have been honestly surprised by the quality of the submissions that we have received, and both their technical and socio-political sophistication. It is all useful experience as well for another cool project that I am directing on cities and digital environmental governance. That project — écoHackMTL — will be running in Montréal this Fall.